This was remarkable for several reasons. Firstly, because hardly anyone in Parma spoke English, and secondly, because it highlighted the fact there are some places in Canada only foreigners seem to visit. And fair enough – it’s expensive getting up to Churchill, and tundra tours aren’t free – but as this Italian man told me about his northern adventures, I realized I couldn’t think of a single Canadian I knew who’d had them, too. This is why Dana and I felt so privileged to go north, to see a part of the world and way of life that are starkly different from our own, but just as Canadian. 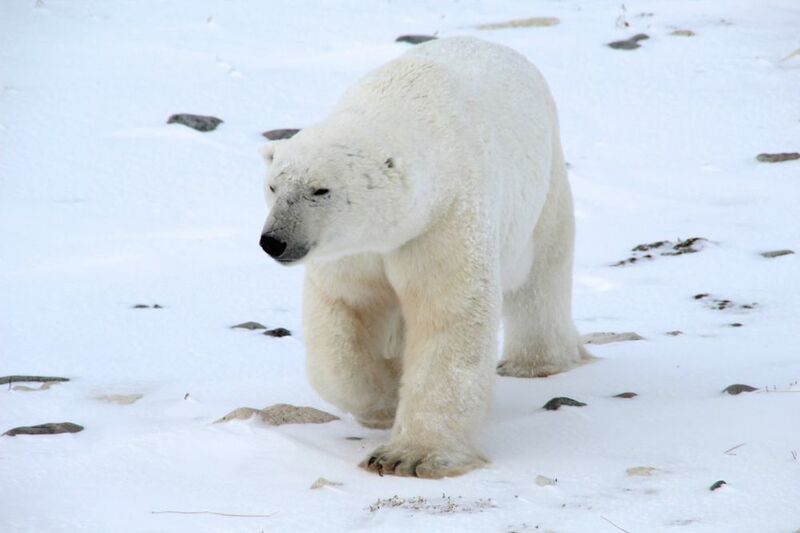 We are privileged because we got to see Churchill, a town that sits directly on the migratory route of southernmost population of polar bears – WILD POLAR BEARS – who make their way out to the ice each winter to hunt for seals. And we are fortunate to have learned more about the history of the Inuit who, despite my inability to comprehend it, have survived for thousands of years on the snowy tundra. It’s a landscape that seems absolutely unforgiving. For us, Churchill had originally been a happy stop-over on the way to Nunavut, so the fact we arrived conveniently at the tail end of polar bear season seemed like undeserved good fortune. Undeserved, but appreciated nonetheless. Frontiers North offered to take us out on one of their Tundra Buggy® tours, and with a few warnings that all the bears may have moved on at that point, we headed out in one of their custom-built tundra trucks. They have wheels that stand taller than my head, and move stealthily across the frozen land. Looking out, I couldn’t help but feel skeptical we’d be able to find bears in such a world of white, but I hoped we’d at least see another arctic fox. They’re darn cute. My skepticism was unwarranted, however; while it still seems miraculous to me, we saw two polar bears that day, and the experience was reverential. I couldn’t have been more impressed if every creature from Narnia had appeared. The bears were enormous. They have legs like tree trunks, which seem to be as wide at the paws as where their legs meet their massive bodies. These plate-like paws, of course, help them move on top of the snow and ice, rather than falling through it. Their necks can extend to an almost comical length, and the first bear we saw had visible battle scars across its face. We watched as it lumbered across the ice (the word ‘lumber’ was invented for polar bears, I swear), and as it stopped to punch through the ice for a kelp snack. Three or four times, it reared up on its hind legs, then slammed its front paws down, thrusting all of its great weight onto the ice to puncture it. and even dig a hole in which to nap. They are terrifyingly large, but it was adorable. Frontiers North fed us sandwiches, hot soup, tea, and coffee throughout the day, and before we knew it, we were rumbling back to their buggy ‘docking station,’ then driving back into town. That night we had dinner at the Tundra Inn pub; it was packed with people, their bulky winter gear all stuffed beneath the tables. They serve dishes like elk meatloaf and arctic char, but we opted for our servers’ favourite – the house-made wild rice veggie burgers. They were amazing—a great way to wind down a truly remarkable day. With our close call the day before and warnings of polar bear attacks in earlier months, we were a bit paranoid as we left. Dana, however, reassured me by popping up her hood and declaring loudly “I’M ON BEAR WATCH! !” As she said this, she hit a patch of ice and her legs, slowly but surely, spread out beneath her until she was lying face first in the snow. Do you know how sorry I am that I don't have a picture? Needless to say, this lightened the mood (she still regularly calls “Bear Watch!” as we leave restaurants), and we made it back to our B&B. I should probably mention that Churchill is a perfectly safe place so long as you’re not running out onto frozen ice during the migratory season, so don’t be afraid to go yourselves. The experience is truly awesome. Thank you SO much to Frontiers North (and our wonderful guide, Simon) for taking us out. It was a once-in-a-lifetime opportunity, and we could not be more grateful. Also, for anyone wanting to know more about polar bears, including the crisis they face from global warming, we recommend checking out this website.